Splash out on dinner at Heston Blumenthal’s Fat Duck restaurant, and you might find an iPod accompanies your seafood risotto. Sounds of the sea enhance the perceived freshness and flavours, and can also affect our sense of sweetness and saltiness. Caterpillars, already popular in Africa, contain 28mg of protein per 100g, more than minced beef, and add 35mg of iron too. If you’re in search of a calcium boost, try grasshoppers. Rising food prices, the growing population and environmental concerns make food one of the big debates for governments, and interest areas for investors. Meat production takes up huge amounts of land, consume water, diverts crops from humans, and adds to carbon emissions. Insects, perhaps rebranding as micro-protein, could become a staple of our diets – low cost, requiring little space or water. With 1500 edible species, we could soon be tucking into nutrititous crickets and grasshoppers, ground into burgers. Wasps are a delicacy in Japan. If you still want meat, your next steak could be sourced from a test-tube. Strips of muscle tissue using stem cells taken from cows, a little like calamari to look at, are grown in a lab, and then shaped to expectation, similar to existing meat substitutes such as Quorn. Of course you could just become vegetarian, and still get a balanced diet. Another source of improved eating, is sensory-engineering. Scientists have shown that look and smell affect how we taste. Condiment Junkie, a sonic-branding company is exploring how certain frequencies can compensate for sugar in foods, thereby improving health, as well as enhancing the whole cooking and eating experience. However the most significant source of future food is likely to come from algae. 145 species of green, red, and brown seaweed is already eaten in huge quantities across Asia, often as a delicacy. Ground into other foods, its strong flavour can dramatically reduce the amount of salt used, for example in bread or prepared meals. Algae farming, for food as well as energy, could become the world’s largest crop industry by 2030. 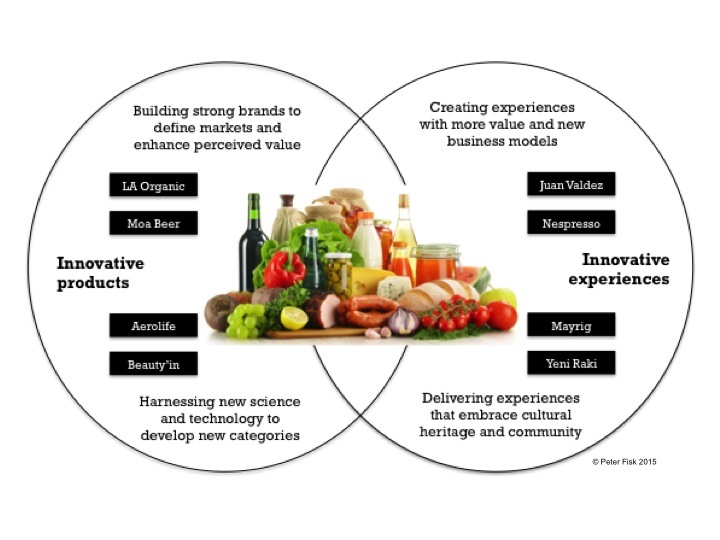 “Gamechangers” in the world of food range from those who are delivering science fiction like Aerolife’s breathable pizza, more profitable business models like Nespresso, to others who are turning commodities into brands like Zespri and richer experiences like Juan Valdez.